Hold a high school degree or equivalent with at least a 2.5 Cumulative GPA. Use this free foreign grade conversion tool to determine your GPA equivalence. Hold a 4-year bachelor’s degree or equivalent with at least 3.0 cumulative GPA. Use this free foreign grade conversion tool to determine your GPA equivalence. All master’s degree programs have additional admissions requirements. Choose your program of interest from the degree programs page and then select “Entrance Requirements” to learn more. For students whose first language is not English: official English proficiency test scores within the past 2 years of at least 6.5 on IELTS Academic, 90 on TOEFL iBT or 58 on PTE, unless you have earned a full-time, on-campus degree from Canada, Australia, the UK, or the US within the past 2 years. Hold a master’s degree or equivalent with at least 3.0 cumulative GPA. Use this free foreign grade conversion tool to determine your GPA equivalence. All PhD programs have additional admissions requirements. Choose your program of interest from the degree programs page and then select “Entrance Requirements” to learn more. Hold a high school degree or equivalent. If you are planning to enroll in a degree program after completing ESL, please refer to the Degree Programs section above for admissions requirements to our bachelor’s and master’s programs. Use this free foreign grade conversion tool to determine your GPA equivalence. 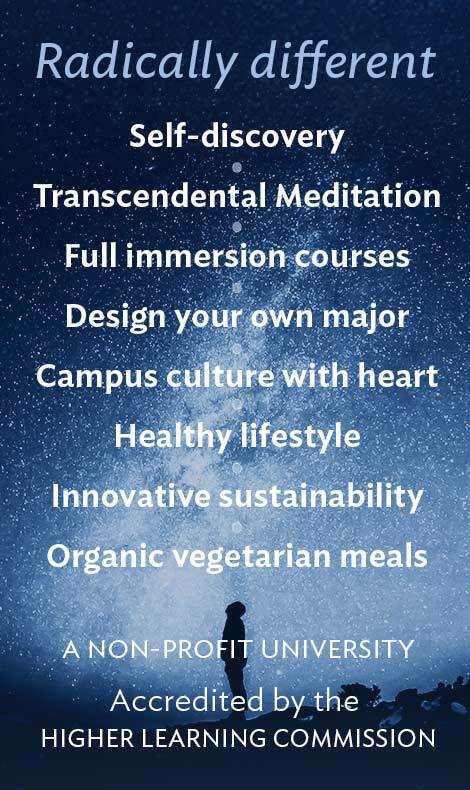 Practice the Transcendental Meditation® technique. Find a certified instructor near you. Hold a high school degree or equivalent. If you are planning to enroll in a degree program after completing this certificate, please refer to the Degree Programs above below for admissions requirements to our bachelor’s and master’s programs. Use this free foreign grade conversion tool to determine your GPA equivalence. English proficiency will be assessed with an essay and an admissions interview. If you are applying for an enrichment course, you do not have to go through the university admissions process. See available MUM Online enrichment courses. If you are visiting the US and wish to experience our university, you can sign up for up to 8 credits as a guest student. You’ll get to participate in class but will not receive academic credit or transcripts after completing your course(s).If you live outside the US, you should apply for a B-1/B-2 (Visitor) visa, which allows for short recreational courses. For more information on this visa category, visit the U.S. State Department page. Please note that the practice of Transcendental Meditation® is required to participate in MUM courses. 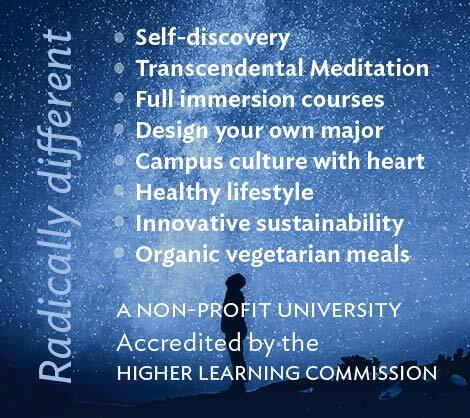 Visit the worldwide Transcendental Meditation website directory to find a certified instructor in your country. Select a course from our class list schedule. Pay attention to the ‘Prerequisites’ column — only courses without prerequisites are open to guest students. Write down the exact code and course title; you’ll need to include these on the application form. Submit an online application. Your counselor will email you a short list of items needed, which you must submit two weeks before your course starts. Pay your course fees one week before your course starts. Payment instructions will be provided upon acceptance.